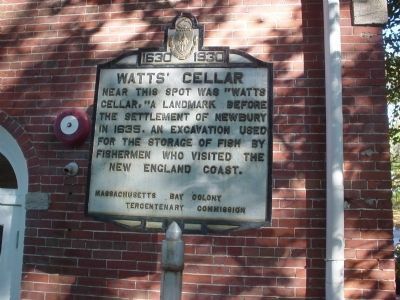 Near this spot was "Watts Cellar," a landmark before the settlement of Newbury in 1635. An excavation used for the storage of fish by fishermen who visited the New England coast. Erected 1930 by Massachusetts Bay Colony-Tercentenary Commission. Location. 42° 48.707′ N, 70° 52.239′ W. Marker is in Newburyport, Massachusetts, in Essex County. Marker is on Merrimac St., on the left when traveling east. Touch for map. This marker is at the side of the "Newburyport Firehouse", a popular and well-known civic center. 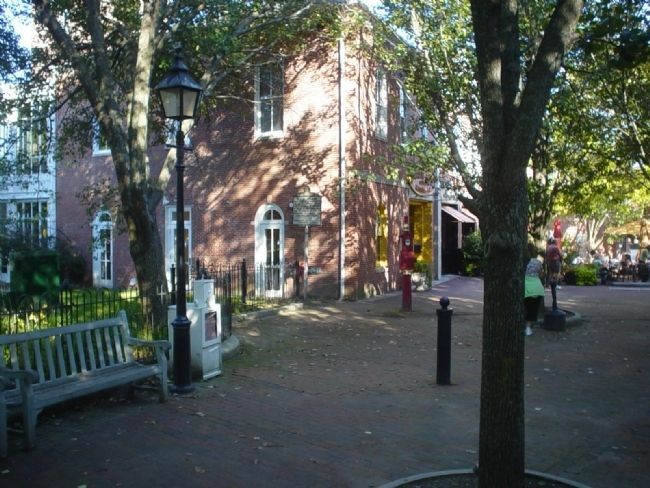 Marker is in this post office area: Newburyport MA 01950, United States of America. Touch for directions. Here the marker can be barely be seen amidst the trees and shadows around the Firehouse and busy sidewalk. (about 800 feet away); William Lloyd Garrison (about 800 feet away); Newburyport Sailor's Memorial (approx. 0.2 miles away); Dalton House (approx. ¼ mile away); The 1873 Train Wreck (approx. ¼ mile away). Touch for a list and map of all markers in Newburyport. More. Search the internet for Watts' Cellar. Credits. This page was last revised on June 16, 2016. This page originally submitted on October 9, 2011, by Michael Tiernan of Danvers, Massachusetts. This page has been viewed 641 times since then and 14 times this year. Photos: 1, 2. submitted on October 9, 2011, by Michael Tiernan of Danvers, Massachusetts. • Bill Pfingsten was the editor who published this page.